Fatal and/or serious hepatotoxicity occurred in 16% to 18% of Zydelig-treated patients. Monitor hepatic function prior to and during treatment. Interrupt and then reduce or discontinue Zydelig as recommended [see Dosage and Administration (2.2), Warnings and Precautions (5.1)]. Fatal and/or serious and severe diarrhea or colitis occurred in 14% to 20% of Zydelig-treated patients. Monitor for the development of severe diarrhea or colitis. Interrupt and then reduce or discontinue Zydelig as recommended [see Dosage and Administration (2.2), Warnings and Precautions (5.2)]. Fatal and/or serious pneumonitis occurred in 4% of Zydelig-treated patients. Monitor for pulmonary symptoms and bilateral interstitial infiltrates. Interrupt or discontinue Zydelig as recommended [see Dosage and Administration (2.2), Warnings and Precautions (5.3)]. Fatal and/or serious infections occurred in 21% to 48% of Zydelig-treated patients. Monitor for signs and symptoms of infection. Interrupt Zydelig if infection is suspected [see Dosage and Administration (2.2), Warnings and Precautions (5.4)]. Fatal and serious intestinal perforation can occur in Zydelig-treated patients across clinical trials. Discontinue Zydelig for intestinal perforation [see Warnings and Precautions (5.5)]. These highlights do not include all the information needed to use ZYDELIG safely and effectively. See full prescribing information for ZYDELIG. Zydelig is indicated for the treatment of patients with relapsed follicular B-cell non-Hodgkin lymphoma (FL) who have received at least two prior systemic therapies. Accelerated approval was granted for this indication based on Overall Response Rate [see Clinical Studies (14.2)]. An improvement in patient survival or disease related symptoms has not been established. Continued approval for this indication may be contingent upon verification of clinical benefit in confirmatory trials. Accelerated approval was granted for this indication based on Overall Response Rate [see Clinical Studies (14.3)]. An improvement in patient survival or disease related symptoms has not been established. Continued approval for this indication may be contingent upon verification of clinical benefit in confirmatory trials. See Table 1 for dose modification instructions for specific toxicities related to Zydelig. For other severe or life-threatening toxicities related to Zydelig, withhold drug until toxicity is resolved. If resuming Zydelig after interruption for other severe or life-threatening toxicities, reduce the dose to 100 mg twice daily. Discontinue Zydelig permanently for recurrence of other severe or life-threatening Zydelig-related toxicity upon rechallenge. Moderate diarrhea: increase of 4–6 stools per day over baseline; severe diarrhea: increase of ≥7 stools per day over baseline. Maintain Zydelig dose. Monitor at least weekly until ≤1 × ULN. Withhold Zydelig. Monitor at least weekly until ALT/AST are ≤1 × ULN, then may resume Zydelig at 100 mg BID. Discontinue Zydelig permanently. Maintain Zydelig dose. Monitor at least weekly until ≤1 × ULN. Withhold Zydelig. Monitor at least weekly until bilirubin is ≤1 × ULN, then may resume Zydelig at 100 mg BID. Discontinue Zydelig permanently. 150 mg tablets: pink, oval-shaped, film-coated tablet debossed with "GSI" on one side and "150" on the other side. 100 mg tablets: orange, oval-shaped, film-coated tablet debossed with "GSI" on one side and "100" on the other side. History of serious allergic reactions including anaphylaxis and toxic epidermal necrolysis [see Warnings and Precautions (5.6, 5.7)] . Fatal and/or serious hepatotoxicity occurred in 18% of patients treated with Zydelig monotherapy and 16% of patients treated with Zydelig in combination with rituximab or with unapproved combination therapies. Elevations in ALT or AST greater than 5 times the upper limit of normal have occurred [see Adverse Reactions (6.1)]. These findings were generally observed within the first 12 weeks of treatment and were reversible with dose interruption. After resumption of treatment at a lower dose, 26% of patients had recurrence of ALT and AST elevations. Discontinue Zydelig for recurrent hepatotoxicity. Monitor ALT and AST in all patients every 2 weeks for the first 3 months of treatment, every 4 weeks for the next 3 months, then every 1 to 3 months thereafter. Monitor weekly for liver toxicity if the ALT or AST rises above 3 times the upper limit of normal until resolved. Withhold Zydelig if the ALT or AST is greater than 5 times the upper limit of normal, and continue to monitor AST, ALT and total bilirubin weekly until the abnormality is resolved [see Dosage and Administration (2.2)]. Severe diarrhea or colitis (Grade 3 or higher) occurred in 14% of patients treated with Zydelig monotherapy and 20% of patients treated with Zydelig in combination with rituximab or with unapproved combination therapies [see Adverse Reactions (6.1)]. Diarrhea can occur at any time. Avoid concurrent use of Zydelig and other drugs that cause diarrhea. Diarrhea due to Zydelig responds poorly to antimotility agents. Median time to resolution ranged between 1 week and 1 month across trials, following interruption of Zydelig therapy and in some instances, use of corticosteroids [see Dosage and Administration (2.2)]. Fatal and serious pneumonitis occurred in patients treated with Zydelig. Clinical manifestations included interstitial infiltrates and organizing pneumonia. In randomized clinical trials of combination therapies, pneumonitis occurred in 4% of patients treated with Zydelig compared to 1% on the comparator arms. Time to onset of pneumonitis ranged from <1 to 15 months. Monitor patients on Zydelig for pulmonary symptoms. In patients taking Zydelig who present with pulmonary symptoms such as cough, dyspnea, hypoxia, interstitial infiltrates on a radiologic exam, or a decline by more than 5% in oxygen saturation, interrupt Zydelig until the etiology has been determined. If symptomatic pneumonitis or organizing pneumonia is diagnosed, initiate appropriate treatment with corticosteroids and permanently discontinue Zydelig [see Dosage and Administration (2.2)]. Fatal and/or serious infections occurred in 21% of patients treated with Zydelig monotherapy and 48% of patients treated with Zydelig in combination with rituximab or with unapproved combination therapies [see Adverse Reactions (6.1)]. The most common infections were pneumonia, sepsis, and febrile neutropenia. Treat infections prior to initiation of Zydelig therapy. Monitor patients on Zydelig for signs and symptoms of infection, and interrupt Zydelig for Grade 3 or higher infection [see Dosage and Administration (2.2)]. Serious or fatal Pneumocystis jirovecii pneumonia (PJP) or cytomegalovirus (CMV) occurred in <1% of patients treated with Zydelig. Provide PJP prophylaxis during treatment with Zydelig. Interrupt Zydelig in patients with suspected PJP infection of any grade, and permanently discontinue Zydelig if PJP infection of any grade is confirmed. Regular clinical and laboratory monitoring for CMV infection is recommended in patients with history of CMV infection or positive CMV serology at the start of treatment with Zydelig. Interrupt Zydelig in the setting of positive CMV PCR or antigen test until the viremia has resolved. If Zydelig is subsequently resumed, patients should be monitored by PCR or antigen test for CMV reactivation at least monthly [see Dosage and Administration (2.2)]. Other severe or life-threatening (Grade ≥3) cutaneous reactions, including dermatitis exfoliative, rash, rash erythematous, rash generalized, rash macular, rash maculo-papular, rash papular, rash pruritic, exfoliative rash, and skin disorder, have been reported in Zydelig-treated patients. Monitor patients for the development of severe cutaneous reactions and discontinue Zydelig. Treatment-emergent Grade 3 or 4 neutropenia occurred in 25% of patients treated with Zydelig monotherapy and 58% of patients treated with Zydelig in combination with rituximab or with unapproved combination therapies. Monitor blood counts at least every 2 weeks for the first 6 months of therapy, and at least weekly in patients while neutrophil counts are less than 1.0 Gi/L [see Dosage and Administration (2.2)]. Based on findings in animals and its mechanism of action, Zydelig may cause fetal harm when administered to a pregnant woman. In animal reproduction studies, administration of idelalisib to pregnant rats during organogenesis caused decreased fetal weight and congenital malformations at systemic exposures 12 times those reported in patients at the recommended dose of 150 mg twice daily. Advise pregnant women of the potential risk to a fetus. Advise females of reproductive potential to use effective contraception during treatment and for at least 1 month after the last dose. [see Use in Specific Populations (8.1, 8.3), Clinical Pharmacology (12.1), and Nonclinical Toxicology (13.1)]. The safety data reflect exposure to Zydelig from two randomized, double-blind clinical trials (Studies 312-0116 and 312-0115) in 634 patients with relapsed CLL [see Clinical Studies (14.1)] and one randomized, open-label trial in 259 patients with relapsed CLL (Study 312-0119). Patients with relapsed CLL received up to 8 doses of rituximab (R) with or without Zydelig 150 mg twice daily. The median duration of exposure to Zydelig was 8 months. Serious adverse reactions were reported in 65 (59%) patients treated with Zydelig + R The most frequent serious adverse reactions reported for patients treated with Zydelig + R were pneumonia (23%), diarrhea (10%), pyrexia (9%), sepsis (8%), and febrile neutropenia (5%). Adverse reactions that led to discontinuation of Zydelig occurred in 19 (17%) patients. The most common adverse reactions that led to treatment discontinuations were hepatotoxicity and diarrhea/colitis. Diarrhea includes the following preferred terms: diarrhea, colitis. Abdominal pain includes the following preferred terms: abdominal pain, abdominal pain upper, abdominal pain lower. Pneumonia includes the terms: pneumonia, pneumonitis, lung infection, lung infiltration, pneumocystis jiroveci pneumonia, pneumonia legionella, lung infection pseudomonal, pneumonia fungal, respiratory tract infection, lower respiratory tract infection, and lower respiratory tract infection bacterial. Rash includes the following preferred terms: dermatitis exfoliative, drug eruption, rash, rash erythematous, rash generalized, rash macular, rash maculo-papular, rash papular, rash pruritic, rash morbilliform, and exfoliative rash. Adverse reactions that led to discontinuation of Zydelig occurred in 71 (41%) patients. One hundred and ten (64%) patients had dose interruptions and 42 (24%) patients had dose reductions due to adverse reactions or laboratory abnormalities. The most common reasons for dose discontinuations, reductions, or interruptions were diarrhea and colitis. The most common adverse reactions were diarrhea (55%), pyrexia (38%), nausea (34%), and fatigue (34%). The safety data reflect exposure to Zydelig from three open-label clinical trials (Studies 101-09 (NCT01282424), 101-02 (NCT00710528), and 101-10 (NCT01306643) in 146 patients with indolent non-Hodgkin lymphoma (iNHL) treated with Zydelig 150 mg twice daily [see Clinical Studies (14.2, 14.3)]. The median duration of exposure was 6.1 months (range 0.3 to 26.4 months). Diarrhea includes the following preferred terms: diarrhea, colitis, enterocolitis, and gastrointestinal inflammation. Abdominal pain includes the following preferred terms: abdominal pain, abdominal pain upper, abdominal pain lower, and abdominal discomfort. Pneumonia includes the terms: pneumonia, pneumonitis, interstitial lung disease, lung infiltration, pneumonia aspiration, respiratory tract infection, atypical pneumonia, lung infection, pneumocystis jiroveci pneumonia, bronchopneumonia, pneumonia necrotizing, lower respiratory tract infection, pneumonia pneumococcal, pneumonia staphylococcal, pneumonia streptococcal, pneumonia cytomegaloviral, and respiratory syncytial virus infection. Rash includes the following preferred terms: dermatitis exfoliative, rash, rash erythematous, rash macular, rash maculo-papular, rash pruritic, and exfoliative rash. Safety data described below reflect exposure to Zydelig in three randomized, double-blind clinical trials (Studies 312-0123, 313-0124, and 313-0125) in patients with CLL and iNHL. Coadministration with strong CYP3A inhibitors may increase idelalisib concentrations [see Clinical Pharmacology (12.3)]. If unable to use alternative drugs, monitor patients more frequently for Zydelig adverse reactions [see Adverse Reactions (6.1)]. Coadministration with strong CYP3A inducers may decrease idelalisib concentrations [see Clinical Pharmacology (12.3)]. Prevention or Management Avoid coadministration of Zydelig with strong CYP3A4 inducers. The coadministration of Zydelig with a CYP3A substrate may increase the concentrations of this CYP3A substrate. Avoid coadministration of Zydelig with sensitive CYP3A substrates [see Clinical Pharmacology (12.3)]. Based on findings in animal studies (see Data) and the mechanism of action [see Clinical Pharmacology (12.1)], Zydelig may cause fetal harm when administered to a pregnant woman. All pregnancies have a background risk of birth defect, loss, or other adverse outcomes. The background risk of major birth defects and miscarriage for the indicated population is unknown. However, the background risk of major birth defects is 2–4% and of miscarriage is 15–20% of clinically recognized pregnancies in the U.S. general population. Based on animal studies, Zydelig may cause fetal harm when administered to a pregnant woman [see Use in Specific Populations (8.1)]. Females of reproductive potential should have a pregnancy test prior to starting treatment with Zydelig. Based on animal studies, Zydelig can cause fetal harm when administered to a pregnant woman [see Use in Specific Populations (8.1)]. Advise females of reproductive potential to use effective contraception during treatment with Zydelig and for at least 1 month after the last dose. Based on findings in animal reproduction studies, advise male patients with female partners of reproductive potential to use effective contraception during treatment and for 3 months after the last dose of Zydelig [see Use in Specific Populations (8.1)]. In clinical trials of Zydelig in 615 patients with FL, SLL, and CLL, 327 (53%) patients were age 65 and older. No major differences in effectiveness were observed. When comparing patients 65 years of age or older to younger patients with indolent non-Hodgkin lymphoma, older patients had a higher incidence of discontinuation due to an adverse reaction (28% vs 20%), higher incidence of serious adverse reactions (64% vs 37%), and higher incidence of death (11% vs 5%). When comparing patients 65 years of age or older to younger patients with CLL, older patients had a higher incidence of discontinuation due to an adverse reaction (36% vs 28%), higher incidence of serious adverse reactions (73% vs 67%), and higher incidence of death (13% vs 9%). Dose adjustment is not recommended for patients with ALT or AST or bilirubin > upper limit of normal (ULN); however, limited safety and efficacy data are available for patients with baseline AST or ALT > 2.5 × ULN or bilirubin > 1.5 × ULN. Monitor patients with baseline hepatic impairment for signs of Zydelig toxicity [see Warnings and Precautions (5)]. Follow dose modifications for adverse reactions [see Dosage and Administration (2.2)]. Idelalisib is a white to off-white solid with a pH-dependent aqueous solubility ranging from <0.1 mg/mL at pH 5–7 to over 1 mg/mL at pH 2 under ambient conditions. Idelalisib is an inhibitor of PI3Kδ kinase, which is expressed in normal and malignant B-cells. Idelalisib induced apoptosis and inhibited proliferation in cell lines derived from malignant B-cells and in primary tumor cells. Idelalisib inhibits several cell signaling pathways, including B-cell receptor (BCR) signaling and the CXCR4 and CXCR5 signaling, which are involved in trafficking and homing of B-cells to the lymph nodes and bone marrow. Treatment of lymphoma cells with idelalisib resulted in inhibition of chemotaxis and adhesion, and reduced cell viability. Following 150 mg twice daily administration of idelalisib, average (% coefficient of variation) maximum concentrations (Cmax) and area under the curve (AUC) at steady-state were 1861 (43%) ng/mL and 10598 (41%) ng∙h/mL for idelalisib. The population apparent systemic clearance at steady-state is 14.9 L/hr (%CV ~ 38%). The population terminal elimination half-life of idelalisib is 8.2 hours. The mean AUC increased up to 1.7-fold in patients with hepatic impairment (defined as ALT or AST or bilirubin values ≥ ULN) compared to patients with normal hepatic function. There is limited information on idelalisib exposure in patients with baseline AST or ALT > 2.5 × ULN or bilirubin > 1.5 × ULN [see Specific Populations (8.6)]. The coadministration of rifampin (strong CYP3A inducer and P-gp inducer) to healthy subjects decreased the mean idelalisib AUC by 75% and the mean Cmax by 58% [see Drug Interactions (7.1)]. The coadministration of ketoconazole (strong CYP3A inhibitor and P-gp inhibitor) to healthy subjects increased the mean idelalisib AUC by 1.8-fold. No changes in the mean Cmax were observed [see Drug Interactions (7.1)]. The mean Cmax of midazolam increased by 2.4-fold and the mean AUC of midazolam increased by 5.4-fold when midazolam (sensitive CYP3A substrate) was coadministered with Zydelig [see Drug Interactions (7.2)]. 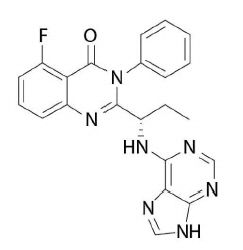 Zydelig was evaluated in a randomized, double-blind, placebo-controlled study GS-US-312-0116 (referred to as 312-0116) (NCT01539512) in 220 patients with relapsed CLL who required treatment and were unable to tolerate standard chemoimmunotherapy due to coexisting medical conditions, reduced renal function as measured by creatinine clearance < 60 mL/min, or NCI CTCAE Grade ≥ 3 neutropenia or Grade ≥ 3 thrombocytopenia resulting from myelotoxic effects of prior therapy with cytotoxic agents. Patients were randomized 1:1 to receive 8 doses of rituximab (first dose at 375 mg/m2, subsequent doses at 500 mg/m2 every 2 weeks for 4 infusions and every 4 weeks for an additional 4 infusions) in combination with either an oral placebo twice daily or with Zydelig 150 mg taken twice daily until disease progression or unacceptable toxicity. In Study 312-0116, the median age was 71 years (range 47, 92) with 78% over 65, 66% were male, and 90% were Caucasian. The median time since diagnosis was 8.5 years. The median number of prior therapies was 3. Nearly all (96%) patients had received prior anti-CD20 monoclonal antibodies. The most common (>15%) prior regimens were: bendamustine + rituximab (BR) (98 patients, 45%), fludarabine + cyclophosphamide + rituximab (75 patients, 34%), single-agent rituximab (67 patients, 31%), fludarabine + rituximab (37 patients, 17%), and chlorambucil (36 patients, 16%). The median CIRS (Cumulative Illness Rating Scale) score was 8 (range 0–17), and 85% of patients had a score of >6. Median Karnofsky score was 80. Median estimated Creatinine Clearance (eCrCl) was 63.6 mL/min, with 41% of patients having an eCrCl of <60 mL/min. At screening, 19.5% of patients had a platelet count of <50 × 109/L, and 13.2% had an absolute neutrophil count (ANC) of <1 × 109/L. The p value for PFS was based on stratified log-rank test. ORR defined as the proportion of patients who achieved a complete response (CR) or PR. All PRs achieved; none of the patients achieved a CR. The safety and efficacy of Zydelig in patients with FL was evaluated in a single-arm, multicenter study 101-09 (NCT01282424) which included 72 patients with follicular B-cell non-Hodgkin lymphoma who had relapsed within 6 months following rituximab and an alkylating agent and had received at least 2 prior treatments. The median age was 62 years (range 33 to 84), 54% were male, and 90% were Caucasian. At enrollment, 92% of patients had a baseline ECOG performance status of 0 or 1. The median time since diagnosis was 4.7 years and the median number of prior treatments was 4 (range 2 to 12). The most common prior combination regimens were R-CHOP (49%), BR (50%), and R-CVP (28%). At baseline, 33% of patients had extranodal involvement and 26% had bone marrow involvement. The safety and efficacy of Zydelig in patients with SLL was evaluated in a single-arm, multicenter study 101-09 (NCT01282424) which included 26 patients with small lymphocytic lymphoma who had relapsed within 6 months following rituximab and an alkylating agent and had received at least 2 prior treatments. The median age was 65 years (range 50 to 87), 73% were male, and 81% were Caucasian. At enrollment, 96% of patients had a baseline ECOG performance status of 0 or 1. The median time since diagnosis was 6.7 years and the median number of prior treatments was 4 (range 2 to 9). The most common prior combination regimens were BR (81%), FCR (62%) and R-CHOP (35%). At baseline, 27% of patients had extranodal involvement. Advise patients that Zydelig can cause significant elevations in liver enzymes, and that serial testing of serum liver tests (ALT, AST, and bilirubin) are recommended while taking Zydelig [see Warnings and Precautions (5.1)]. Advise patients to report symptoms of liver dysfunction including jaundice, bruising, abdominal pain, or bleeding. Advise patients that Zydelig may cause severe diarrhea or colitis and to notify their healthcare provider immediately if the number of bowel movements in a day increases by six or more [see Warnings and Precautions (5.2)]. Advise patients of the possibility of pneumonitis, and to report any new or worsening respiratory symptoms including cough or dyspnea [see Warnings and Precautions (5.3)]. Advise patients that Zydelig can cause serious infections that may be fatal. Advise patients to immediately report symptoms of infection (e.g. pyrexia) [see Warnings and Precautions (5.4)]. Advise patients of the possibility for intestinal perforation and to notify their healthcare provider immediately if they experience severe abdominal pain [see Warnings and Precautions (5.5)]. Advise patients that Zydelig may cause severe cutaneous reactions and to notify their healthcare provider immediately if they develop a severe skin reaction [see Warnings and Precautions (5.6)]. Advise patients that anaphylaxis can occur during treatment with Zydelig and to notify their healthcare provider immediately if they experience symptoms of anaphylaxis [see Warnings and Precautions (5.7)]. Advise patients of the need for periodic monitoring of blood counts. Advise patients to notify their healthcare provider immediately if they develop a fever or any signs of infection [see Warnings and Precautions (5.8)]. Advise females of reproductive potential to use effective contraception during treatment and for 1 month after receiving the last dose of Zydelig [see Warnings and Precautions (5.9) and Use in Specific Populations (8.1, 8.3)]. Advise lactating women not to breastfeed during treatment with Zydelig and for at least 1 month after the last dose [see Use in Specific Populations (8.2)]. GSI and Zydelig are trademarks or registered trademarks of Gilead Sciences, Inc., or its related companies. All other trademarks referenced herein are the property of their respective owners. Severe diarrhea. Diarrhea is common during treatment with Zydelig and can sometimes be severe. Tell your doctor right away if the number of bowel movements you have in a day increases by six or more. Ask your doctor about medicines you can take to treat your diarrhea. Lung problems (pneumonitis). Your doctor may do tests to check your lungs if you have breathing problems during treatment with Zydelig. Tell your doctor right away if you get new or worsening cough, shortness of breath, difficulty breathing, or wheezing. Your doctor may treat you with a corticosteroid medicine if you develop lung problems. Infections. Zydelig can cause serious infections that may lead to death. Tell your doctor right away if you have a fever or any signs of an infection during treatment with Zydelig. See "What are the possible side effects of Zydelig?" for more information about side effects. Chronic Lymphocytic Leukemia (CLL) in combination with rituximab when CLL comes back after prior cancer treatment and when rituximab treatment alone may be used due to other health problems. Follicular B-cell non-Hodgkin Lymphoma (FL) when the disease has come back after treatment with at least two prior medicines. Small Lymphocytic Lymphoma (SLL) when the disease comes back after treatment with at least two prior medicines. Zydelig should not be used as the first medicine to treat people with CLL, FL, or SLL. 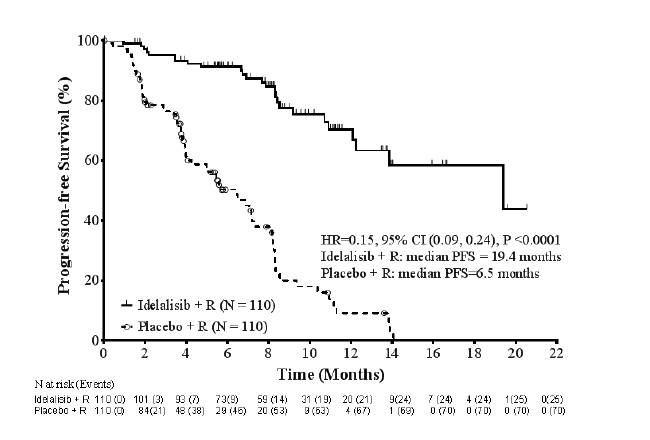 Zydelig should not be used in combination with bendamustine and/or rituximab to treat people with FL. It is not known if Zydelig is safe and effective in children less than 18 years of age. Do not take Zydelig if you have a history of serious allergic reactions including a severe skin reaction called toxic epidermal necrolysis (TEN). are pregnant or plan to become pregnant. Zydelig may harm your unborn baby. Females who are able to become pregnant should have a pregnancy test before starting treatment with Zydelig. Females who are able to become pregnant should use effective birth control (contraception) during treatment with Zydelig and for at least 1 month after the last dose of Zydelig. Talk to your doctor about birth control methods that may be right for you. Tell your doctor right away if you become pregnant or think you are pregnant during treatment with Zydelig. Males with female partners who are able to become pregnant should use effective birth control (contraception) during treatment with Zydelig and for 3 months after the last dose. are breastfeeding or plan to breastfeed. It is not known if Zydelig passes into your breast milk. Do not breastfeed during your treatment with Zydelig and for at least 1 month after the last dose. Take Zydelig exactly as your doctor tells you to take it. Your doctor may change your dose of Zydelig or tell you to stop taking Zydelig. Do not change your dose or stop taking Zydelig without first talking to your doctor. Take Zydelig 2 times a day. Do not miss a dose of Zydelig. If you miss a dose of Zydelig by less than 6 hours, take the missed dose right away. Then take your next dose as usual. If you miss a dose of Zydelig by more than 6 hours, wait and take the next dose of Zydelig at your usual time. What are the possible side effects of Zydelig? See "What is the most important information I should know about Zydelig?" Anaphylaxis. Tell your doctor or get medical help right away if you have a serious allergic reaction during treatment with Zydelig. Low white blood cell count (neutropenia). Neutropenia is common during treatment with Zydelig and can sometimes be severe. Your doctor will check your blood counts regularly during treatment with Zydelig. Tell your doctor right away if you have a fever or any signs of an infection during treatment with Zydelig. These are not all the possible side effects of Zydelig. Call your doctor for medical advice about side effects. You may report side effects to FDA at 1-800-FDA-1088. How should I store Zydelig? Store Zydelig between 68°F to 86°F (20°C to 30°C). Keep Zydelig in its original container. Do not use Zydelig if the seal over the bottle opening is broken or missing. Keep Zydelig and all medicines out of reach of children. General information about the safe and effective use of Zydelig. Medicines are sometimes prescribed for purposes other than those listed in a Medication Guide. Do not use Zydelig for a condition for which it was not prescribed. Do not give Zydelig to other people, even if they have the same symptoms you have. It may harm them. You can ask your doctor or pharmacist for information about Zydelig that is written for health professionals. What are the ingredients in Zydelig? Inactive ingredients: microcrystalline cellulose, hydroxypropyl cellulose, croscarmellose sodium, sodium starch glycolate, and magnesium stearate. The tablet coating contains polyethylene glycol, talc, polyvinyl alcohol, titanium dioxide and FD&C Yellow #6 or Sunset Yellow FCF Aluminum Lake (for the 100 mg tablet) and red iron oxide (for the 150 mg tablet).